Hope you are all well and having fun preparing for the holidays. Today I've just popped on with a little snippet from the life of the ELF girls. 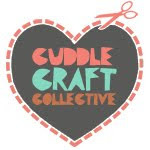 Recently I've been crazy busy with preparing for my last ever exam for my degree, eek! However being a parent waits for no exams and it's been nice having a break from study to do one of my most favourite things in the world..... letting my kids play fancy dress! I really love planning and creating their outfits, and often get a bit carried away with myself, can anyone say over-achiever. Well this month Lois had a 'people who help us' dress up day for the end on her primary one (Kindergarten for the US folk) school topic, and Evie had a fancy dress themed birthday party invite. 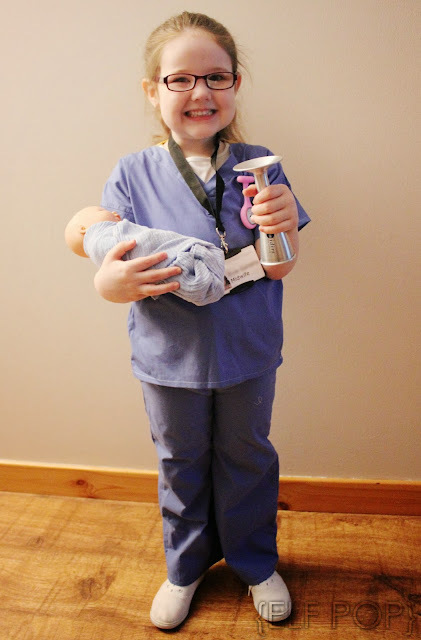 Last year when Evie was in P1 she dressed up as a Midwife and she won' best costume'. I thought I could perhaps get away with using the same costume for Lois this year but she had other ideas. Her request was for someone who wears a skirt. Ok so my first thought was a Nurse, but this idea was poo-pooed by Lois as she "won't win because everyone else is going to be a nurse!" I thought about it for ages but could not find a suitable idea, I types the topic into google, pinterest etc. and eventually stumbled across a clip art of a librarian. I hatched a plan, off to the charity shop to find an old lady skirt. I found the perfect wool checked skirt in the British Heart Foundation for £3. I also got a little jewelled scarf clip for £3, perfect as I was a bit weary of placing a brooch pin so close to her neck. I measured it up, cut, hemmed and resized the skirt to keep the original zipper. The skirt was teamed with a plain white round collared school shirt and a little cardigan. I actually ordered these Mrs Claus style glasses on-line as an accessory but they didn't come in time, although glad they didn't because they were pretty wide and would've been huge on her face. Luckily i bagged a simple pair of reading glasses from Primark for £1 and on the off chance a mini hair doughnut for 50p, what a bargain. 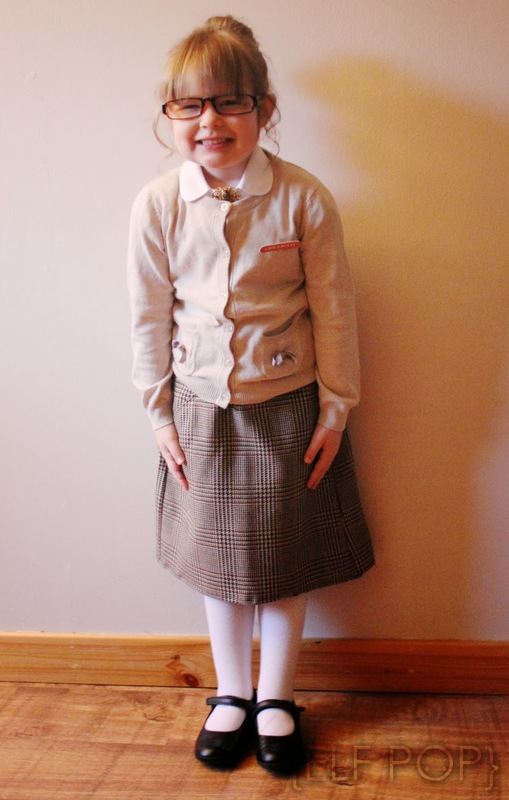 I finished off with a pair of thick white tights and her regular school shoes. You can't really see it too well but she has the little scarf brooch in between the collar at the top button of her shirt. One thing we wanted but couldn't find in time was a spectacle chain which I thought would have been a nice little detail, but hey ho they don't call us Virgos perfectionists for nothing! Not that I'm being bias but I think she looks adorable (sorry for the super crappy lighting my house is super dark in the mornings). And guess who won best dressed? Librarian Lois! 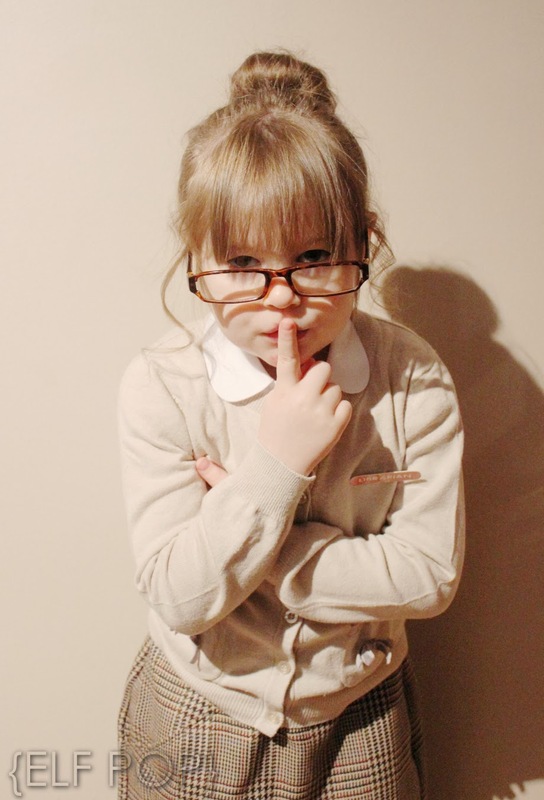 The best thing is she loves this costume and always wants to play libraries with Evie. So onto Evies costume, and although I didn't make this costume I just wanted to show off the results of this video hair tutorial I found by Mindy at Cute Girls Hairstyles. 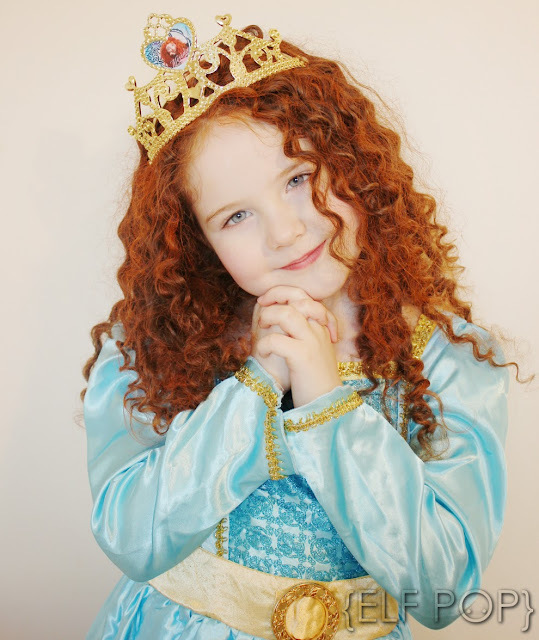 If you've seen Disney Brave you'll know all about Merida and her wild ginger curls. Although Evie has naturally curly hair they tend to be more wavy now her hair is really long. I didn't want to put a wig on her as I knew she wouldn't keep it on. So we gave this tutorial a bash and hoped for the best. This is the curl making in progress complete with her natural hair colour for comparison compare with the finished pics below. 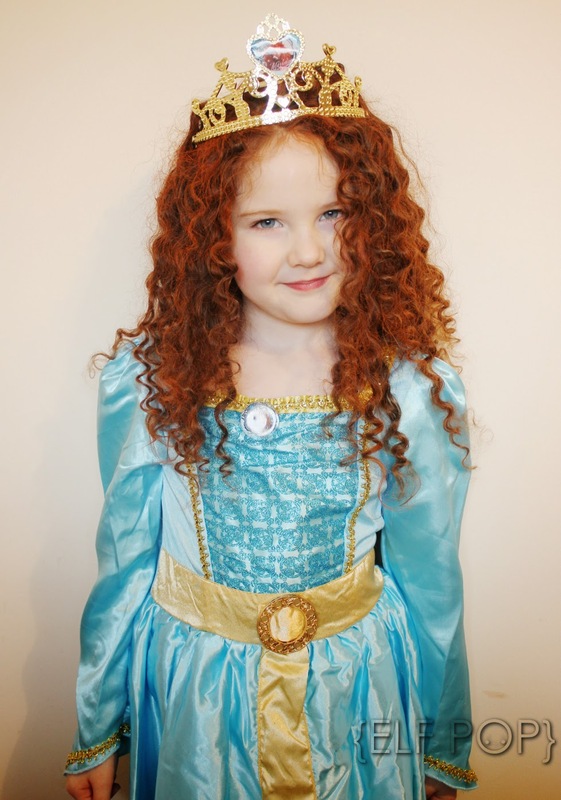 We sprayed on some orange colour hairspray and put on her Merida costume and crown and this is our finished princess. The whole process literally took around 50 min and that was including 25 min under the dryer. We were super happy with the results with Evie exclaiming that she was "the actual real Merida"and everyone raved at how authentic it looked, so thank you Mindy. Hopefully this post may inspired some other parents who are desperately seeking ideas for dress ups! If you like this post let me know and I'll try and share other hints and tips for any more dress up days the girls have. N.B We got the Merida costume in Tesco for £7.50 with the crown, but this is the link to get the same one on Amazon, or there are loads of other cute ones on there and also some cute wee bargain costumes on Ebay.